Patna, Nov 10 : Three teams of experts and scientists will from November 18 begin a comprehensive drive to enumerate the endangered Gangetic dolphins along nearly 1,000 km of the river Ganga and its two major tributaries -- Gandak and Ghaghra -- in Bihar. Scientists expect to find out the exact number of these dolphins by the middle of December after the completion of the first such comprehensive census, officials said on Friday. The survey will help authorities formulate conservation policies and make sure the dolphins' count doesn't dwindle. 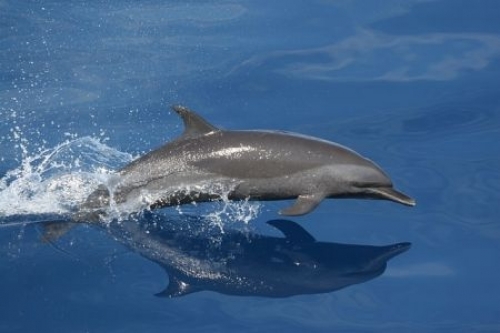 "The census of the endangered dolphins will be completed on December 10. A summary report would be submitted to the government in March next year," Gopal Sharma, senior scientist at the Zoological Survey of India, said here. Sharma will lead one of the teams. The other two groups would be led by Sameer Kumar Sinha of the Wildlife Trust of India, and Sunil Choudhary, Coordinator of Vikramshila Biodiversity Research and Education Centre (VBREC), Tilka Manjhi Bhagalpur University. Sharma told IANS that this would be the first time that a survey is being conducted simultaneously in the Ganga and its two major tributaries. This is also the first time that a coordinated exercise will be made for the dolphin population assessment. According to him, the three teams will begin the survey in their respective zones on the same day to minimise the possibility of duplication in the dolphin count. "I will carry out the survey from Chausa in Buxar district to Mokama in Patna, a stretch of about 300 km in the river Ganga, to count the number of dolphins there during 22 days," Sharma said. Sinha will carry out the survey in Ghaghra and Gandak along a 400-km stretch, while Choudhary will conduct the assessment from Mokama to Manihari, a stretch of about 300 kilometres. Bihar is home to around half of the estimated 3,000 dolphin population in the country. The last survey of the dolphins was conducted in a limited stretch in 2012 in Bihar and nearly 1,500 dolphins were counted then. The Vikramshila Gangetic Dolphin Sanctuary in Bhagalpur district is India's only such sanctuary, spread over 50 km along the Ganges. "Unlike in the past, this time a full survey on a large scale will help count the exact number of dolphins," Sinha said. He said that the survey will help the government take measures for conservation of the dolphins. R.K. Sinha, an expert on Gangetic river dolphins, said that the habitat of the endangered Gangetic river dolphins has been changing due to climate change, threatening their survival. Change in their habitat has resulted in a decrease in their population. "Climate change has impacted the habitat of Gangetic river dolphins. It is visible in the river Ganga and its tributaries. Water levels and the flow (current) have been decreasing, a bad omen for the dolphins," Sinha said. R.K. Sinha, known as the 'Dolphin Man', said that several habitats of the Gangetic river dolphins have shrunk in the past few decades, and many more will follow in coming years due to climate change. "Rising temperature and erratic rainfall are leading to a fast decline in river flow that is bound to hit dolphins," he added. According to him, dolphin presence is a sign of a healthy river ecosystem. Dolphins prefer water that is at least five feet to eight feet deep. They are usually found in turbulent waters, where there are enough fish for them to feed on." Gangetic dolphins live in a zone where there is little or no current, helping them save energy. If they sense danger, they can dive into deep waters. The dolphins swim from the no-current zone to the edges to hunt for fish and return, he said. Demand for water from the river has been increasing with rise in temperature. "We need more water, but water level is declining in the river, putting more pressure on the dolphins to manage their life cycle," R.K. Sinha said. Experts agree that Gangetic dolphins' habitats face serious threats from climate change. They pointed that increasing pollution due to largescale discharge of industrial and municipal waste, siltation, and mechanised boats pose the biggest threat to these freshwater dolphins. The Gangetic river dolphin is India's national aquatic animal but frequently falls prey to poachers. Their carcasses are found regularly on river banks. The Gangetic river dolphin is one of the four freshwater dolphin species in the world. The other three are found in the Yangtze river, China, the Indus river in Pakistan and the Amazon river in South America. The Gangetic river species -- found in India, Bangladesh and Nepal -- is blind and finds its way and prey in the river waters through echoes. These dolphins live by echolocation and sound is everything to them. They navigate, feed, escape danger, find mates, breed, and nurse babies by echolocation.